"What about direct trains from Melksham to Bath (and Bristol)" ... a question that's been asked many times over the years. Here, with personal views included in the answers, is an update from me - looking very much from a Melksham viewpoint, but explaining options and their wider effects too. The railway line through Melksham runs to the north east (to Chippenham and Swindon) and to the south (Trowbridge and Westbury), with up to 9 local passenger trains per day in each direction. The line joins the Bristol and Bath to Reading and London line at Chippenham, and the Bristol and Bath to Salisbury, Southampton and Portsmouth line at Trowbridge, and passengers from Melksham wishing to travel to Bath and Bristol can catch any of the up to 18 trains per day and change at either Chippenham or Trowbridge onto services on the other lines which typically run every 30 minutes, and are planned to step up to 3 services per hour in the future. Many people want to travel from Melksham to Bath and Bristol, and would like a direct train service. The question is often asked "could a curve be reinstated at Bradford Junction" - that's near Trowbridge - to turn the junction into a triangle and allow direct running to Bath. I have also been asked if the south to west curve at Thingley Junction (near Chippenham) could be restored to give direct running from Melksham to Bath and Bristol. The curve at Bradford Junctions was only removed in (about) 1990, and it's my understanding that the trackbed is still available and the line could be restored - indeed it was proposed that it should be done prior to the electrification works at Box Tunnel a couple of years ago so that trains from London to Bristol could be diverted between Chippenham and Bath. In the end, they added a signalling ability to reverse the trains just south of the junction near Trowbridge, and footpaths along the track to allow crew to change ends. Blue on map. The curve at Thingley was removed soon after the second world war, and restoration would be much more problematic. Green on map. As well as 18 passenger train journeys, Melksham station sees a number of freight trains passing through each day - a very variable number but 10 would not be untypical. And at times of engineering or other disruption of other lines, longer distance trains are also diverted through. All of this on a single track without intermediate signal - an absolute maximum capacity of 3 train per hour, and no-where at either Chippenham or Trowbridge to sidetrack a train that's waiting for the single line - such waiting trains block the main line. There is scope for some increase from 9 stopping trains each way per day through Melksham, perhaps adding a very early service, a service for Swindon between 07:49 and 10:02, a service back from Swindon between 15:15 and 17:36, and a late evening round trip. Each and every one of those would generate significant new business. With each extra, that is 13 stopping trains each way per day. Further services, lifting the line to hourly all day, every day would also generate more traffic but on the current infrastructure would lead to unstable timetabling, and long lay-overs of trains at Swindon. 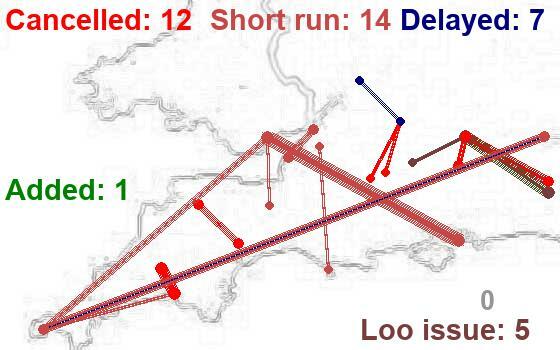 The instability would be particularly awkward because long distance freight trains tend not to be good timekeepers, and furthermore these freight trains need to find paths between Swindon and Chippenham in amongst all the high speed IET trains; a slow freight between two IETs will eat up a number of "paths" as it trundles along. Splitting the maximum service on the current infrastructure headed for Trowbridge to (say) 6 trains to and onward from Westbury, and 6 trains to Bristol Temple Meads via Bath Spa would result in two very thin services. It would disadvantage Swindon / Chippenham to Trowbridge / Westbury passengers (who make up over half the traffic on the current trains) and it would feed a number of awkward, odd, off-pattern trains into the Bath to Bristol corridor. I also question the extra operating cost of this route to Bristol rather than Westbury - it might require an extra train and crew. Far better (in my view) to provide a robust service to Bath and Bristol involving a change at either Trowbridge or Chippenham - with that you have 24 journey opportunities per day with changes, as opposed to the headline "6 direct trains". Diverting half the trains to Bath and Bristol also precludes the planned linkage of the TransWilts service into Westbury - Salisbury and Salisbury - Solent trains for which there is a strong economic, operational and business case. For passengers from Melksham to Bristol, a change of train at Trowbridge or Chippenham, or a change from bus to train at Bath Spa (or to the x39 Bath to Bristol bus) offers a sensible service. Connections, integrated information systems, and tickets that are valid on First's buses or First's trains (you would have thought - same company ...) could really do with improvement. The text above offers, I'm afraid, some pretty powerful reasons why the current train service through Melksham should not be diverted to Bath and Bristol. Nor should it be diverted, even partially (you may argue for one peak service) when increased to the practical current line capacity of around 12 trains each way per day. Looking further ahead, though ... there is a good case for stepping the service up to hourly, and an expectation that freight will increase during HST construction with new traffic from Westbury and to Quidhampton. Stone traffic from the Mendips is likely to increase, and the route forms part of an important backup highway from Southampton to the Midlands and the north of England. Such a step up would require substantial extra infrastructure, with either passing loops or a (near) complete doubling of the route, and with signalling to allow trains to pass along at shorter headways. The track was in any case double until 1967(ish) and whilst the remaining track has been slewed into the centre of the trackbed a lot of the way, and cuttings and embankments may have degraded, it wouldn't be an impossible task to redouble; a couple of pinch points such as the Avon bridge, and an issue with track cant at Thingley if the lines joined in a double junction. 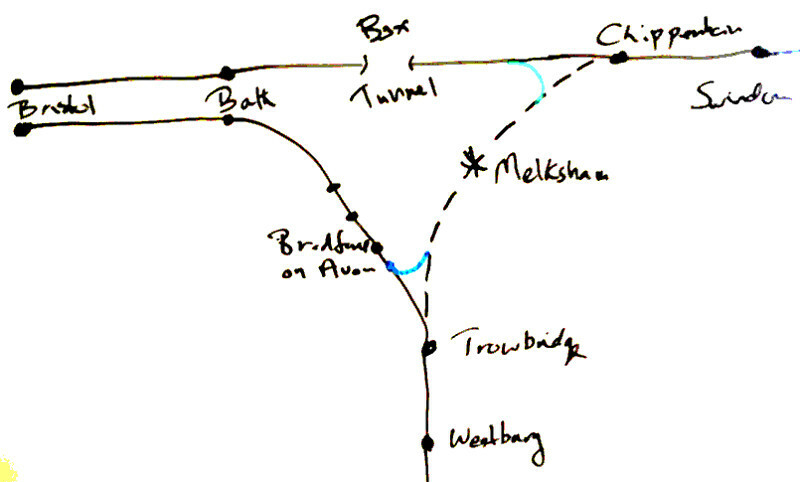 A doubling of the line at Melksham would result in a substantial station rebuild; an alternative is to have a single track section through the station, and single track leads at both Thingley and Bradford Junctions, with two long dynamic loops. That even has some advantages over a plain double track, such as the ability for a slower freight train that's in the way or awaiting the main line to be overtaken. With all the redoubling works under way, and with all GWR IET trains now diesel as well as electric powered, the case for re-instating the Bradford North Curve at the same time to provide for operational robustness should be looked at. With an hourly passenger train each way at Melksham, logic still remains to run the services all to Trowbridge and Westbury, as the dilution and clock face arguments of doing otherwise still apply. However, there becomes an argument for the third train from Bristol running via Bradford-on-Avon to divert via Melksham - to Chippenham terminating there in a relaid bay, or to Swindon. 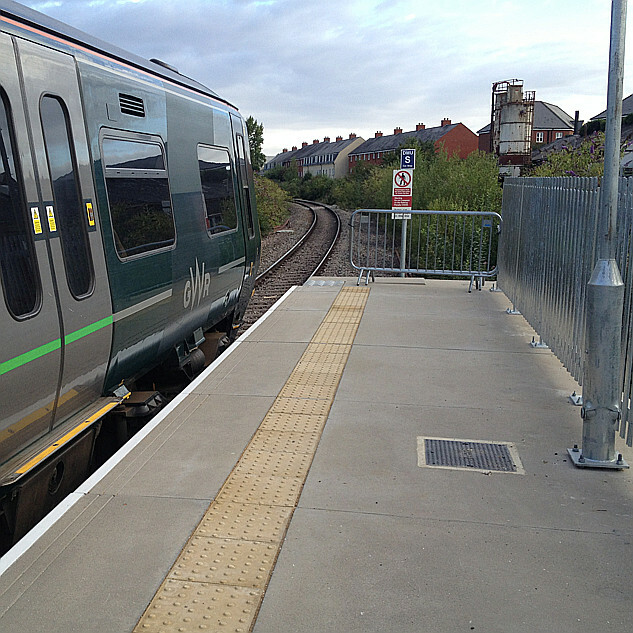 With this frequency, the arguments about a diluted train service from Chippenham to Trowbridge are much reduced, and flows which are very awkward by public transport at present such as Swindon and Chippenham to Bradford on Avon are addressed. But please bear in mind that this is so many steps ahead of where we are today and things are likely to change our of recognition before it happens. As a final note, ideas have been floated about a "Corsham Parkway" station at Thingley Junction, where the linees join and close by the A350 trunk road, and about a "Staverton" station at Bradford Junction where the lines meet. "Corsham Parkway" was, I think, just an idea that was quickly kicked into touch. "Staverton" may get considerable further exposure, being an interchange for faster journeys Melksham to Bath and Bristol and Chippenham to Bradford-on-Avon, an opportunity to pull traffic from Bradford-on-Avon where they have a severe problem with car fumes and dirty air, and also a station for much local traffic within walking distance of the station. Noting this thread is shared within Melksham - here are the times of trains back from Bristol ... also at http://www.mrug.org.uk/bristolfares. For trains to Bath or Bristol, take any train shown at http://www.mrug.org.uk/timetable.html and change at Chippenham or Trowbridge. On Monday to Friday ... catch trains from Bristol Temple Meads at 05:30, 05:44, 06:48, 08:30, 09:07, 10:30, 10:47, 11:22, 12:30, 13:00, 13:22, 15:00, 15:22, 17:00, 17:49, 18:30, 18:51 or 19:30. Journey time between 45 minutes and 1 hour and 15 minutes. All of these trains except the 05:44 also call at Bath Spa 12 to 15 minutes later. On Saturday ... catch trains from Bristol Temple Meads at 06:49, 07:30, 08:51, 09:30, 10:49, 11:30, 12:51, 14:30, 15:51, 17:30, 17:49, 19:30 or 20:40. All of these trains also call at Bath Spa 12 to 15 minutes later. On Sunday ... catch trains from Bristol Temple Meads at 08:53, 09:25, 10:53, 11:10, 13:25, 14:53, 16:15, 17:25, 18:10, 18:45 or 19:25. All of these trains also call at Bath Spa 12 to 15 minutes later. Presumably another argument in favour of restoring the Bradford North curve is that it would allow another diversionary route at times when Box Tunnel is unavailable for use, e.g. due to flooding or works on electrification or routine maintenance. At present all diversions have to go south to Westbury and then up to Reading, but this affects for many local journeys which then have to have bustitution. Could the Trans Wilts line cope with some diversionary services using it? Presumably another argument in favour of restoring the Bradford North curve is that it would allow another diversionary route at times when Box Tunnel is unavailable for use, e.g. due to flooding or works on electrification or routine maintenance. At present all diversions have to go south to Westbury and then up to Reading, but this affects for many local journeys which then have to have bustitution. The restoration was in the plan for the GW electrification - to be done before the major closures of Box tunnel. It was replaced by a cheaper signalling and walkway change just to the south of the current Bradford Junction when it was realised that the electrification scheme might run over budget, so trains can now reverse there without having to go all the way to Westbury. Not sure how long the walkway and signalling section is - whether a 5 + 5 (260 metre) train can reverse there or if the limit is a 2 + 8 (230 metre) train. Could the Trans Wilts line cope with some diversionary services using it? On a weekday and on current infrastructure, you would get a few through each way before you had to start culling other services such as the TransWilts passenger train and replacing it by buses (this was done, and accepted but not welcomed locally) for both the Box Tunnel closures and 50 days (!) of diversions of West of England trains from the Berks and Hants. With Box tunnel closed, there is less of a problem with trains waiting the single track at Chippenham and blocking the main line (it's closed anyway), but currently the added issue of a reversal on the main Cardiff to Portsmouth line. Should future Box / Bath / Newbury closures send traffic around the TransWilts to the extent that they take away the paths of the local service which gets busier by the day, I hope that GWR will stop the IETs that pass along the line to call at Melksham. The platform is now 3 carriages long not 1, the IETs have a far better acceleration even in diesel mode, and there are passenger doors on the front vehicle so they can stop at the regular board and still have plenty of doors opening (more than at some minor stations routinely served, I suspect!). For London to Bristol service running via Chippenham and Bath, I would suggest also a stop at Bradford-on-Avon in these circumstances, allowing regular traffic to continue to use the train (Swindon and Chippenham to Trowbridge and Westbury passengers changing at Bradford-on-Avon) and doing away with the need for rail replacement buses. Rail Replacement buses are pretty universally disliked when compared to trains; it's a sign of just how busy the TransWilts is getting that the first service last Sunday morning was full and standing from Melksham - that's the 'train. we had to fight for to run all year. Totally supportive of reinstating the curve. Why on earth wasn't it done two years ago. I can't believe they actually saved money with the turnback and bus-substitution over such a long period, However if alternate trains went through to Bath/Bristol this might make the Trowbridge to SWI corridor seem less attractive as they will have less trains. Add in the dynamic loops, add in extra trains to make use of them, and we have a reasonable MKM to Bath and MKM to WSB service. Staverton station: I'm not sure I see what advantages this gives in terms of connections compared to changing at Trowbridge. Or is the idea that with a catchment area roughly overlapping BoA and MKM, it would give both Bradfordians and Melkshamites a direct service to (respectively) Swindon and Bristol/Bath, no changes required? Or have I got this all wrong and you're talking about a station on the Bradford-on-Avon curve? 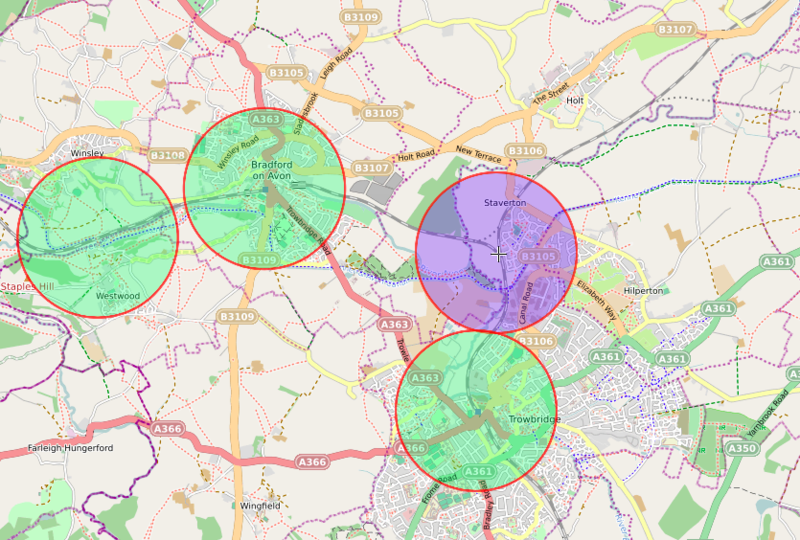 The community of Holt, to the North East, would be within 2 km which is a perfectly reasonable walking and cycling distance; currently residents hanker after decent access to public transport which is limited to the quirky "ZigZag" - 4 a day direct to Trowbridge and 3 back (all between 16:00 and 17:35). 5 each way to and from Bradford-on-Avon (last service back 14:22) and 7 to / from Melksham - last service too early for anyone working in Bath until 17:00 to connect into! Holt would need some improvements to a public footpath, and better consideration for cyclists and pedestrians where the road crosses the river and just to the north thereof. P.S. Potential saving of 5 minutes on Melksham to Bath and Bristol journey, much more if in enables a new connection to be made. Potential mentioned to reverse TransWilts trains there (not sure if I like that). Potential issue if the service isn't as good as neighbouring stations - back to the "where does the Cardiff / Portsmouth train stop" arguments. Those are fantastic reads / resources ... good to remind me and to tell other members. This talk of catchments set me wondering, because it doesn't seem right to assume that buses and train/tram stations have the same catchment size. A study for Bournemouth supports this view, suggesting that whilst heavy rail or metro systems might have a catchment radius of 800m to 1.2km, for tram systems it is nearer 400m to 600m. 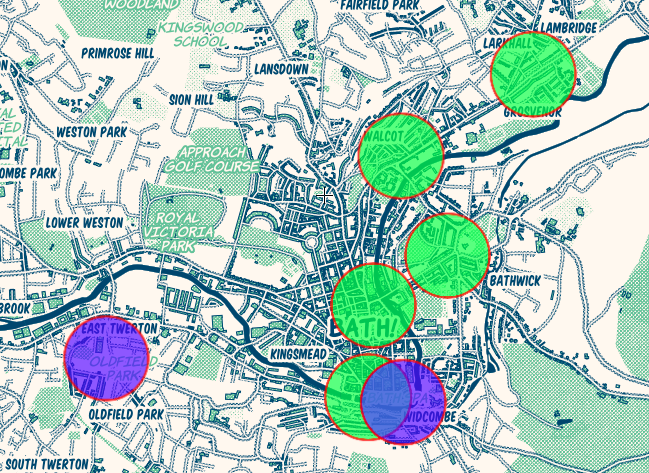 Grahame's 250m radius may well be right for buses. In essence, the catchment increases in proportion to the quality (in all its aspects) of the service. There's a whole separate thread here! I will quote you later when I get back to it - mountainous inbox today. A little bit of background to the line. The Melksham line was officially reduced to a single line (except for a short double track section between Bradford North and Bradford South junctions) on the weekend of the 25th and 26th of February 1967. This was part of the Swindon Stage 3 resignalling scheme, which saw the introduction of multiple aspect signalling which would eventually be controlled from the new power signal box at Swindon. Melksham signal box was officially closed on 24th February 1967 at 16:30. Initially, Thingley Junction signal box controlled the northern end and Bradford Junction signal box the southern end, with electric key token working on the single line between the two. Ground frames were provided at Melksham (for the various sidings) and Holt Junction (for the remaining stub of the Devizes branch that remained as far as Whaddon bridge until the 1980s). Thingley Junction signal box closed as part of stage 6 of the Swindon resignalling scheme on the weekend of the 23rd and 24th March 1968, with control of the Thingley area transferring to Swindon power signal box. Auxiliary token instruments were provided at Thingley and in the cupboard underneath the footbridge at Chippenham station, used under the no signaller token regulations. The layout at Thingley was modified in 1978 to its current layout as part of works to increase the linespeed for the introduction of HST services. All trains from the Melksham line must now use the down line as far as the crossovers at Thingley East, this being the nearest section of straight track for a crosssover because of the canting of the tracks on the curve at Thingley Junction itself as a consequence of the linespeed enhancement work. This line remained like this until 1990. Bradford Junction signal box was by then an island of semaphore signalling fringing the 1960s power signal box installations at Bristol and Swindon and the more recent 1984 installation at Westbury. Bradford Junction would be subsumed as the final part of the Westbury multiple aspect resignalling scheme in March of 1990. In line with other parts of the Westbury scheme (just look at Westbury station and the closure of the original platform one), rationalisation was the order of the day. The short double track section was removed. The north curve was also removed, although a reversing function was provided at the same time to enable trains to reverse to the south of the junction by using the new ladder crossover. With the majority of trains at this time being formed of DMUs or HSTs, the several minute time penalty of reversing south of Bradford Junction was deemed neglible compared to the costs saved by recovering trackwork and simplifying the infrastructure.The single line to Thingley would be worked under track circuit block regulations, with the token equipment and Melksham ground frame recovered (Holt Junction ground frame had already been recovered in the 1980s following the removal of the remaining stub of the Devizes branch). This is the situation that we have today. Decision making of earlier decades was based on cost reduction and a managed decline. Many rationalised lines are now being relaid in order in increase capacity. Unfortunately, the resurgance of rail traffic wasn't factored into the decision making. The cost of reinstating removed infrastructure is very costly. The Melksham single line is often running at capacity, with any late running having an adverse effect on other services (freight and passenger). Unfortunately, the reversing facility at Bradford Junction stops north of Trowbridge station, meaning that a train reversing can't serve the county town. We visited Holt a couple of weekends ago, to visit The Courts (beautiful early flowers if anyone can go). I can attest that the walk or cycle (we cycled) from Bradford on Avon isn't pleasant, as cars race down the narrow hilly main road. A more local station with more pleasant access would be a distinct improvement. Yep ... that road is horrendous to B-o-A. The comments / suggestions for Holt aren't just "book exercises" - feedback is from (multiple) engagement with people who live there. That's useful and fascinating - thank you for filling us in. The north curve was also removed, although a reversing function was provided at the same time to enable trains to reverse to the south of the junction by using the new ladder crossover. So what was the work done just prior to electrification diversions? My previous understanding was that the works to allow this reversal were don just - what - 2 or 3 years ago now.